In any event, I'll just summarise for my own benefit. Tables are courtesy of Wikipedia. Note: Australia were part of the Oceania Football Confederation (OFC) until 2006, but many of their qualifiers involved Asian Football Confederation (AFC) countries. Incredibly, Australia lost 9-2 to North Korea on aggregate. And we played in Phnom Penh, Cambodia of all places for both legs. How does that work?! The North Koreans were the only team we had to beat after the African nations boycotted the tournament and South Korea withdrew. South Africa were banned due to apartheid. The African nations were not happy that they were not given a direct qualification route so they boycotted in protest. Mind you, this was the same North Korean side that would upset Italy 1-0 and take a 3-0 lead against the Portuguese in the Quarterfinals, only to be denied in part by a Eusébio double hattrick. 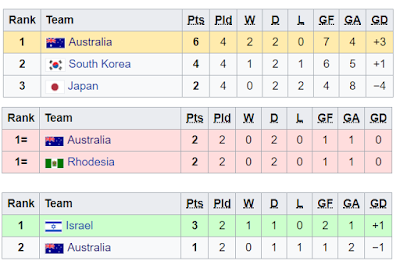 We won arm-wrestles against South Korea and Japan; beat Rhodesia (Zimbabwe) 3-1 in a playoff after we drew twice with them; then lost to Israel in Tel-Aviv. Israel qualified for the first time in their history. Iran were too good in this mixed Asia-Oceania qualification campaign. They made history qualifying for their first World Cup. Although we put in good performances against South Korea and Hong Kong in the final round, we lost home and away to both Iran and Kuwait. Unfortunately, the Socceroos weren't even close. New Zealand were too strong for us in the first round, beating us 0-2 at the SCG. We also lost to Indonesia in Jakarta and drew to Taiwan in Taipei. 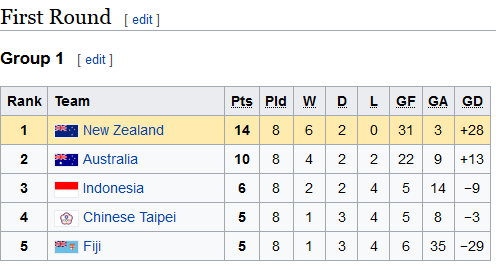 Interestingly New Zealand would go on to beat China 2-1 in a 1981 playoff in neutral Singapore as these two sides sat on the same number of points and goal difference in the final group stage of qualification. Kuwait qualified in top spot. This is probably unsurprising given that they won the 1980 Asian Cup after beating the winner of the South Korea-North Korea derby semi-final. They also scored a memorable goal at the 1982 World Cup (who could forget the moment when their Sheikh came onto the field to ask the referees to reverse a goal awarded to France). It should be noted though that Iran did not participate in these qualifiers. However this shouldn't dampen Kuwait's achievement - Kuwait had knocked out South Korea in an earlier group stage on their way to the 1982 World Cup, certainly not an easy feat because that would be the last time that South Korea failed to qualify for the World Cup at the time of writing. This was probably Kuwait's and NZ's best eras in world football. Only 4 teams were involved at first. Australia topped a group containing Israel, NZ and Taiwan/Chinese Taipei. Unfortunately in the UEFA-OFC playoff we lost to a Scottish team containing Dalglish and Souness 2-0 on aggregate (0-0 in Melbourne). It appears that only 3 Oceania teams (Fiji, Australia and NZ) entered the competition, plus Taiwan and Israel. Fiji and Taiwan were knocked out by Aus and NZ respectively in the first round. Israel topped the group to play 3rd placed in CONMEBOL Colombia, but they lost 0-1 on aggregate. Australia beat Tahiti and Solomon Islands in the group stage; then beat NZ 0-4 on aggregate; then beat Canada on penalties after a 3-3 aggregate draw. Then they lost to Argentina 2-1 on aggregate due to an unfortunate Alex Tobin own goal. Australia beat NZ 0-5 and lost 3-3 on aggregate on away goals to Iran. This defeat to Iran was particularly devastating. In the second leg, at the MCG, the Socceroos were leading 2-0 (3-1 on aggregate) thanks to Kewell's home and away goals and a Vidmar goal too. Just after Australia's second goal, social disrupter Peter Hore ran onto the pitch and cut up Iran's goal net, halting play and largely reversing Australia's momentum. Iran came back to draw 2-2, making the aggregate score the same. Since they scored 2 goals in Melbourne, as opposed to our 1 goal in Tehran, Iran proceeded at our expense. Australia pipped Fiji to the top of the OFC group but lost 3-1 on aggregate to Uruguay. A Kevin Muscat penalty in Melbourne was not enough for an Okon-led Socceroos to overcome three goals scored by their opponents in Montevideo. It's clear that we have had our fair share of disappointments. Iran and Israel were each responsible for 2. But other countries have at different stages of history thwarted our forward march. The lesson is that Australia should not take World Cup Qualification for granted because qualifying is a very precious accomplishment. For example, we certainly need not discuss the 2005 match against Uruguay (our gateway to the 2006 World Cup) as that is something written into Socceroos and Australian sports folklore. 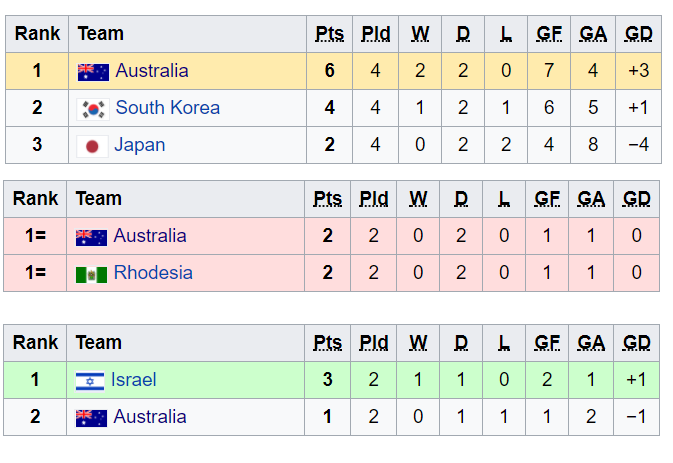 The road to the 1974 World Cup was also interesting because we topped a group containing Indonesia, Iraq and New Zealand; then beat Iran 3-2 on aggregate; then we beat South Korea 1-0 in neutral Hong Kong after tying with them on aggregate.